Election officials in Haiti say they will review the disputed result of last month's presidential election. There will be an immediate vote recount in the presence of the top three candidates - Mirlande Manigat, Jude Celestin and Michel Martelly - and international observers. The announcement follows violent demonstrations by supporters of Mr Martelly, the third-placed candidate. He alleges the count was rigged to deny him a second-round run-off place. The Provisional Election Council said it had "decided to immediately launch a rapid and exceptional process to verify at the counting centre the tally sheets linked to the 2010 presidential elections". Since the polls on 28 November, more than half of the 19 candidates have called for the result to be annulled. Meanwhile, a second medical study has traced the outbreak of cholera in Haiti - which has killed 2,000 people since October - to UN peacekeepers from South Asia. The research published in the New England Journal of Medicine supports the link, which was reported last month by the US Centers for Disease Control. The UN has denied the claim. Election results announced on Tuesday night gave 31% to the former first lady, Ms Manigat, with the governing party candidate, Mr Celestin, in second place with 22%. The strongest protests have come from supporters of pop star Mr Martelly, known to his supporters as "Sweet Micky," who was widely expected to go through to the second round. Violence erupted almost immediately after the results were made public. Most independent observers were sceptical when the government's presidential candidate Jude Celestin came through the first round of voting at the expense of streetwise pop star Michel Martelly. Two days of anti-government protests followed, which led to the closure of the airport and other businesses. On Wednesday the protesters got support from the highly influential US embassy in Port-au-Prince. The results of the first round, the embassy said, were inconsistent with the projections made by respected local and international observers. It was probably this pressure from the US embassy which led the electoral commission to order a recount. What happens next is far from clear. One option, depending on the result of the recount, is that first round may turn out to have been so close that not two but three candidates may stand in the decisive second round runoff. Thousands of supporters of Mr Martelly took to the streets of the capital, Port-au-Prince, setting up burning barricades and clashing with UN peacekeepers. On Wednesday, the headquarters of the governing party in Port-au-Prince was set on fire and the international airport was closed because of the unrest. There was also violence in several other cities. 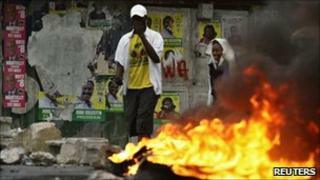 Canada on Thursday said it was closing its embassy in Port-au-Prince, due to the protests in the country's capital. Mr Martelly urged his supporters to hold only non-violent protests. He accused the election commission of "plunging the country into crisis with its incorrect results". The outgoing president Rene Preval appealed for calm and defended the result. Mr Celestin is widely seen as Mr Preval's hand-picked successor. Most observers said the first round of voting was grossly mismanaged, with widespread irregularities. The US embassy said on Tuesday it was concerned the results were "inconsistent" with vote counts around the country. The run-off is due to take place on 16 January. A successful election is seen as crucial to establishing an effective government in Haiti after years of instability. Whoever becomes president will face the task of rebuilding the country after the devastating earthquake that killed around 230,000 people last January, as well as battling a cholera epidemic. Separately, former Alaskan Governor Sarah Palin is due to visit the country this weekend with the relief organisation Samaritan's Purse, aides of the former vice-president nominee said.